Restrained, respectable English style in the interior is not a historical style, concluded in a certain time frame. This is an ethnic style that characterizes the life and habits of aristocratic England. 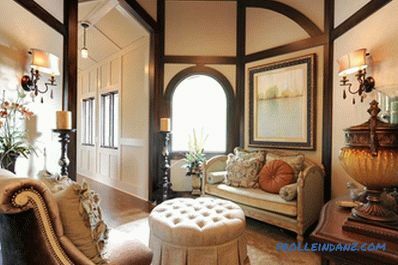 Restraint, practicality, oriental flavor of the English colonies, classical symmetry and color harmony are inherent in it. 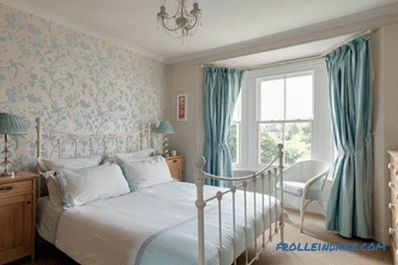 English interiors are decorated in the style of Baroque, Gothic, Classical and Realism. However, they all share common features that characterize the lifestyle of the English aristocracy. Most characteristic of England are the interiors of the reign of Queen Victoria (Victorian style) and King George (Georgian style). They were formed in the era of prosperity and development of the country - in the late XVII - early XVIII century. 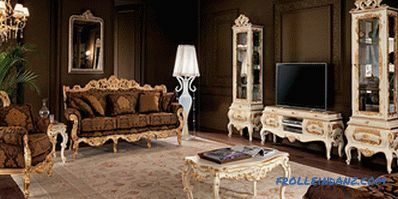 As a rule, they are distinguished by expensive respectable furniture and room decoration, the presence in the interior of overseas decorative items made of precious and rare materials (elephant bone, mahogany). A remarkable feature that distinguishes the English design of that period is considered to be a colonial gloss. That is, in the interiors there were often ornamental and household items brought from India, Africa, America or Australia. They fit into the setting. According to custom, such items were taken care of and passed from generation to generation in excellent condition. 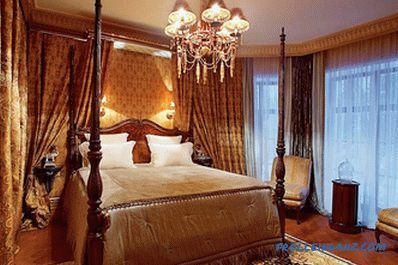 The main feature that characterizes the interior design in the English style is the abundance of antique furniture, decor, dishes in authentic surroundings. Council. Creating the English style in the interior of a modern apartment, you need to pick up finishing materials, furniture, textiles and lighting in the spirit of old England, not allowing even a hint of modernity, speed of life, functionality of household appliances. The interior should create the impression of refined solidity, regularity and good quality. # 1. To collectors, as the furnishings of the English rooms are replete with collections of beautiful dolls, exquisite dishes, antique furniture, decorative elephants, rhinos, and other items. On the mantelpiece, in the showcase of cabinets have a variety of collections. # 2. 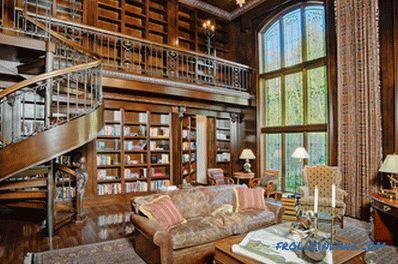 Fans of reading natural paper books in a comfortable chair in front of a fireplace, because an English house must have a home library. And regardless of its size, number and content of books, it is a place of rest and a study at the same time. Books have in large wooden cabinets, equipped with a ladder (in order to easily get any book). In addition, libraries are equipped with a massive table and a comfortable chair with a standing floor lamp next to it. # 3. 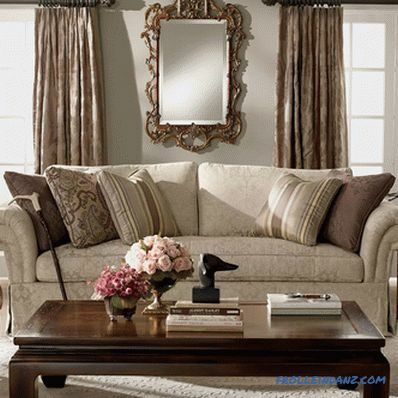 Connoisseurs of beautiful, comfortable and expensive furniture from solid wood and fabric upholstery. 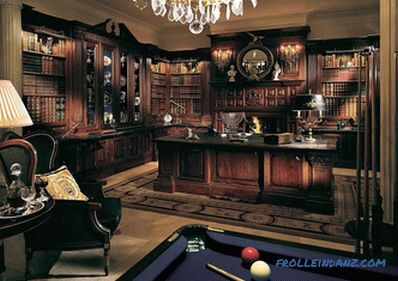 In the English interiors furniture sets play a leading role. The furniture is carefully selected, combining various objects among themselves. It is bought not for one season, but for centuries. # 4. 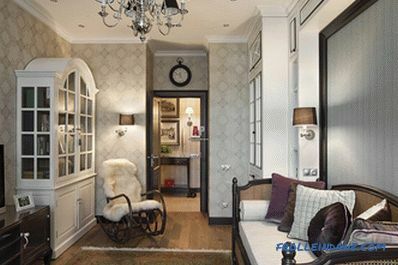 Owners of small apartments will have an English-style interior design that will be most welcome. Since the rooms in the English houses are small and even cramped. This is due to climatic features. 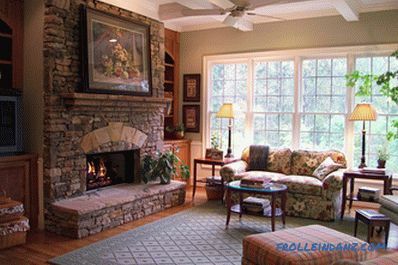 A small room can be better heated in wet and windy weather. 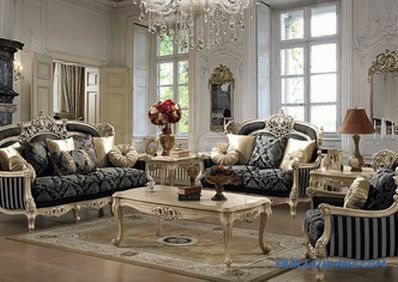 In this regard, the British can safely borrow the principles of interior decoration, the use of colors and ways of arranging furniture. # 5. Adherents of the classics will like interiors with symmetry, harmony and precise proportions. 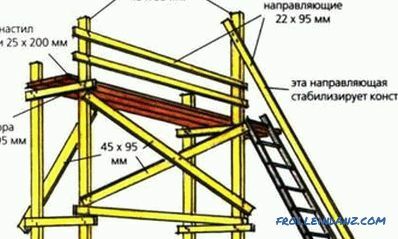 There is nothing superfluous in the design, everything is in its place. 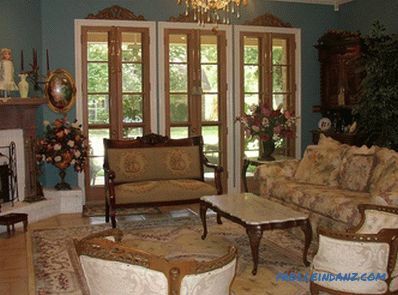 furnishings are decorated with decor — photographs in frames, statues, mirrors, paintings and portraits, vases. 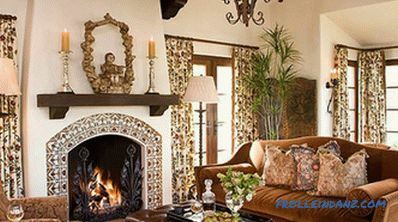 The main principle that governs all the interior decoration and arrangement of rooms is symmetry. 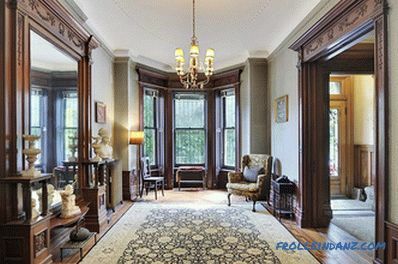 Doors in the corridors, windows, rooms - everything is arranged symmetrically.As mentioned above, often English houses are characterized by the presence of small rooms. But at the same time, they can have two floors. A beautiful staircase in the living room leading to the second floor is not only a characteristic sign of style, but also an important element of the division of space. # 2. dark brown, sandy, chocolate and beige. Note. 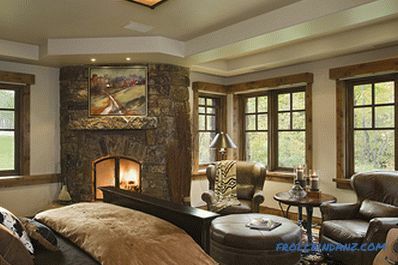 Using dark, muted colors to decorate rooms is a typical sign. At the same time, this rule works: rooms facing the south side are decorated in cold green, blue, gray tones, and those that go to the north side make them visually warmer and more comfortable using warm colors - chocolate, ocher, crimson, sand. Bright interiors are less common, but also allowed by style. 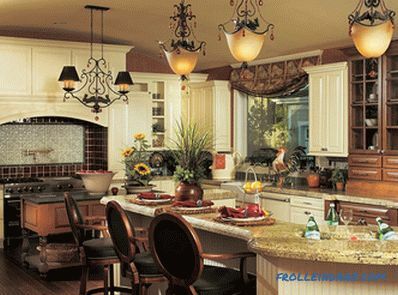 Usually for surfaces choose white, beige, light gray colors. 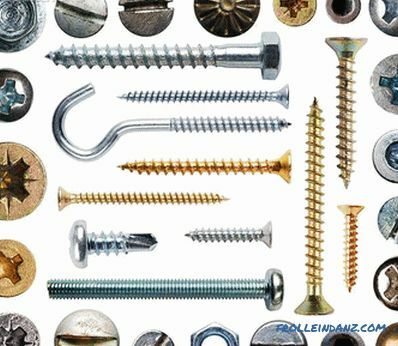 At the same time, they try to combine furniture upholstery with decorations and patterns on the walls, and wooden parts can be either light or dark wood. # 1. The plane of the wall is divided horizontally, while the lower part is sewn up with oak or walnut panels, and the upper part is painted with matte light paint. # 2. The wall is visually separated using overlay moldings, after they, together with the surface, are painted in the same color. # 3. In order to visually raise low ceilings, use wallpaper with stripes, in rooms with high ceilings, patterned wallpapers with monograms or floral patterns are glued. Most often, the ceiling is simply whitewashed or painted with light paint. To give it a finished look, its perimeter is decorated with stucco moldings (echo of classics and baroque). 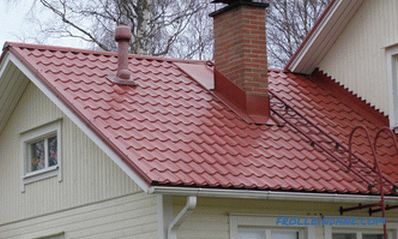 Eaves are painted to match the walls or ceiling, sometimes made gilded. 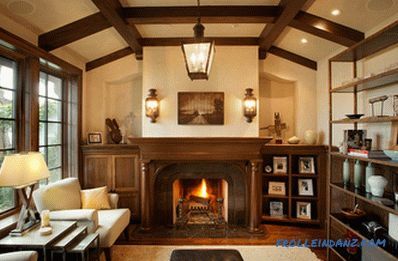 If the room is designed in the style of rustic country, the ceiling is decorated with wooden boards or beams. 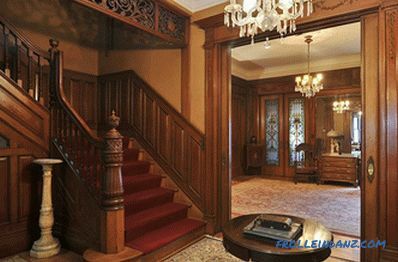 In the historic interiors, artistic parquet, polished boards, and stone tiles were used. Today it is permissible to use modern materials that imitate natural texture. 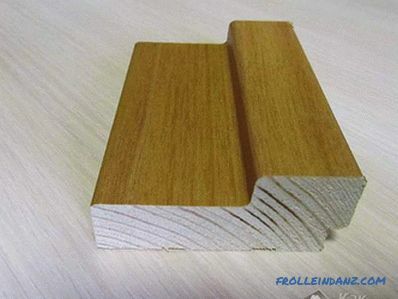 For example, to decorate the living room you can choose a laminate or floorboard. Ceramic tiles are placed on the floor in the bathroom and kitchen. It can be laid out in a pattern, play with the size, color and texture of the details. The floor in the living room and bedroom is covered with a beautiful warm carpet with an oriental ornament. 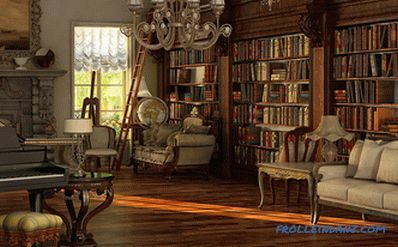 In order to properly organize the lighting in the spirit of colonial England, you need to choose several options for soft ambient lighting for each zone. This reception is especially relevant for the living room. 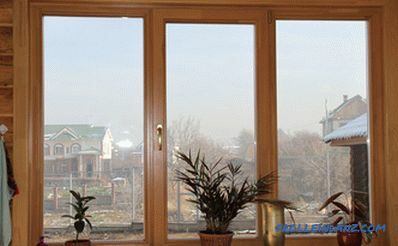 It separately illuminates the area for reading, evening tea and board games. Next to the sofa and chairs, several floor lamps are installed, sconces are suspended above them. 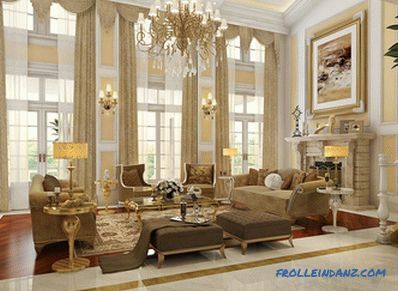 In the living room it is also customary to hang a large chandelier with glass hangers. However, such a technique can only be used with high ceilings. To illuminate the bedroom, install lights on the bedside tables, hang a wall lamp next to the dressing table, and fix the ceiling with a small chandelier for 1 to 3 horns. The large dining room is lit with several chandeliers and lamps. For a small kitchen and one sufficient lighting device. 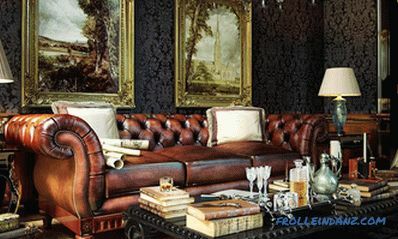 The English-style interior design is, above all, good-quality, expensive furniture. The British buy furniture for themselves and future generations. Tables, cabinets, dressers, bedside tables, shelves are made of oak wood, mahogany or cheaper walnut. 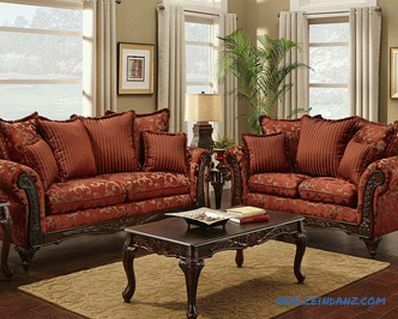 Upholstered furniture is characterized by convenience, respectable appearance and beautiful fabric upholstery. It can be striped, tartan or with a floral pattern. 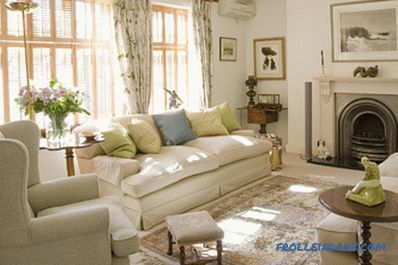 Characteristic for English life are soft armchairs with "ears", wardrobes with a small glass cover (stained glass), sofas with round armrests and an abundance of pillows. The aristocratic commitment to the abundance of beautiful textiles embodies English style in the interior. 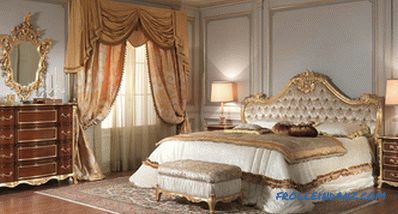 When decorating rooms, velvet heavy fabrics, damask, tapestry, checkered or striped chintz are selected. 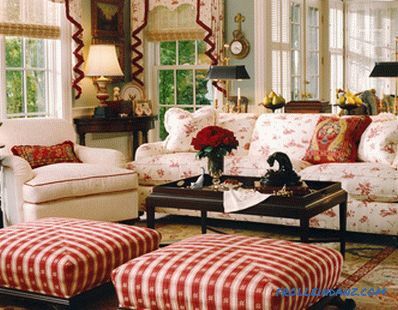 The pattern on the fabric and furniture upholstery is selected very carefully, it should be harmoniously combined. the dressing table is covered with an embroidered or lace tablecloth. The integral decorative element of the English situation is a fireplace. If earlier it had a practical load - it heated the room - now it performs a decorative function. He creates in the room a unique feeling of peace and comfort. 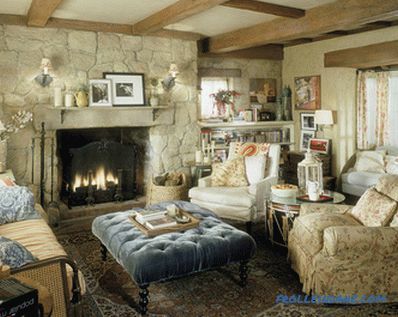 Today, for the arrangement of the fireplace area does not need to make a chimney. After all, modern systems work environmentally friendly and safe.